Progression should be based on careful monitoring by the Physical Therapist of the patient's functional status. Avoid direct palpation and mobilization on incisions/portals for 4 weeks. Exercises should focus on proper patella tracking and recruitment of the Vastus Medialis Oblique (VMO). Exercises should focus on lumbopelvic stabilization in all planes of motion and all transfers. No cutting or twisting until cleared by Sports Test I. Patient should be well aware that healing and tissue maturation continue to take place for 1 year after surgery. Patients are given Sports Test I at 3 months , Sports Test II at 6 months, Sports Test III at 1 year. Nurse appt on day 2 for dressing change and review of home program. Ice/elevation every 2 hours for 15 minutes to minimize edema and promote healing (please refer to Icing handout). Soft tissue treatment to quads, posterior musculature, suprapatellar pouch, popliteal fossa, iliotibial band and Hoffa’s fat pad. Extensive patellar mobilization. No direct scar mobilization x 4 weeks. Seated edge of bed dangle for knee flexion; prop for knee extension. Nurse appt for suture removal on day 14. Walking for exercise for 15-20 minutes if no limp or swelling present. Continue with soft tissue treatment, effleurage for edema. 2” step up/down, intense core training. Aerobic exercises as tolerated (bilateral stationary bike, Elliptical, arm bike). Active range of motion equal extension to uninvolved side and flexion to 120 degrees. No edema. Full weight-bearing; normal gait without assistive device. Single leg balance 60 seconds on level surface. Continue with soft tissue mobilization. Apply direct scar tissue mobilization; can use instruments/tools. Introduce eccentric exercises (4-6” steps). Increase single leg strength, challenge proprioceptive training. Full Range Of Motion equal to uninvolved leg. Bike with minimal resistance for 20-30 minutes (in saddle), walking for 30 minutes, Elliptical, water-walking. Soft tissue mobilization and joint mobilization as needed. Add lateral training exercises (lateral step ups, lunges, step overs). MD visit at 3 months. Fit for functional knee brace if requested by MD. Sport test 2 at 6 months. Initiate return to run program. Implementation of jump training, agility training. Education of “at risk sports”. 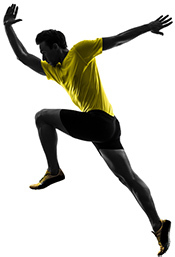 Initiate sagittal plane plyometrics, work towards single leg plyometrics. Clearance by MD and pass Sportsmetric training before returning to full athletics.